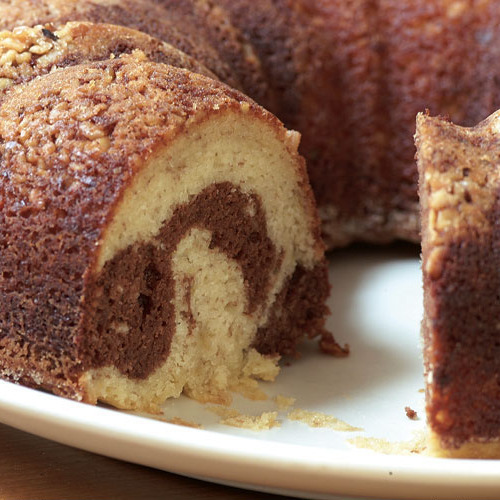 This cake puts very ripe bananas to good use. Be sure to follow the time guidelines for unmolding the cake. If you wait too long, it will stick to the pan; take it out too early and it might break into chunks. Position a rack in the middle of the oven and heat the oven to 350°F. In a small bowl, mix the sugar with the chopped walnuts. Generously butter a large bundt pan and coat with the nuts and sugar, pressing the nuts with your fingers to help them stick. The pan sides will be coated and some of the nuts will fall to the bottom—that’s fine. In a medium bowl, whisk the flour, baking powder, baking soda, and salt until well blended. With an electric mixer (I use a Kitchen Aid fitted with the paddle attachment), beat the butter, sugar, bananas, and vanilla until well blended and the bananas are almost smooth, scraping down the sides of the bowl as needed. Add the eggs one at a time, beating until just incorporated. Remove the bowl from the mixer. With a rubber spatula, alternately add half the flour mixture, all the buttermilk, and then the rest of the flour mixture, stirring until each addition is just blended. Spoon half the batter into a medium bowl and gently stir in the melted chocolate until just combined. With a large spoon, alternately add a spoonful of each batter to the prepared pan, working around the pan until all the batter is used. Gently run a knife or the tip of a rubber spatula through the batter, once clockwise and once counterclockwise, to slightly swirl the batters. Gently tap the pan on the counter to settle the ingredients. Bake until a pick inserted in the center comes out with just a few crumbs sticking to it, about 40 min. Let the cake cool on a wire rack for 15 min. Gently tap the the sides of the pan on the counter and loosen the cake. Invert the pan onto the rack, lift it off the pan, and let the cake cool completely. I've made this several times and it's always delicious and easy. Very flavourful. More like a quick bread than a a cake. While the taste is delicious, I had difficulty unmolding the cake. I let it cool exactly 15 minutes and it would not release from the pan. I had to use a plastic spatula rather aggressively to finally get it out (in pieces). Next time I'm going to mix my walnuts in my batter and prepare the pan conventionally (butter and flour it). I was a little apprehensive because the butter was still in small clumps after mixing all the wet ingredients together. Then I read the first review about mixing the butter and sugar together first, and then adding the other wet ingredients. Uh oh! However, the final result was wonderful and very addicting. Thinking about having a third piece right now. I do think creaming the butter and sugar first would resolve anxiety about the final result so that's why I only gave 4 stars. 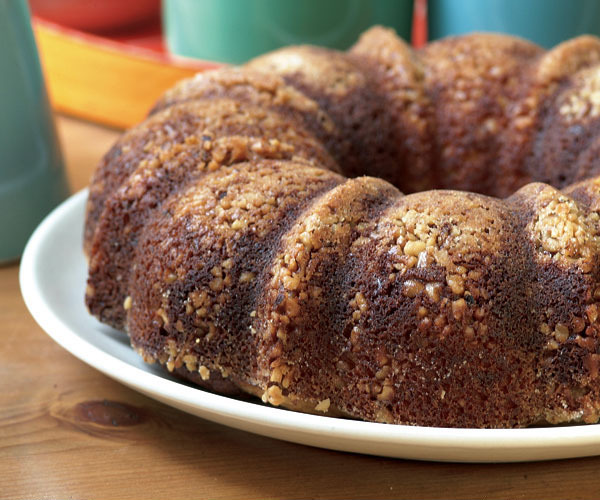 Banana cakes develop more flavor as they cool but this one might not have the chance for that. Definitely a keeper.